What can you do if you know a reference check is going to kill you? Here is what happened to a candidate I placed. That candidate was hired. He got a 50% raise at his new job. No kidding. 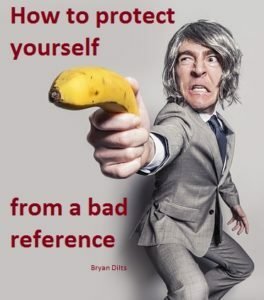 The easiest way to deal with a bad reference is not to give out that name. In some cases the company insists on a specific reference, and you know it will be bad. Tell them in advance what the complaints will be. Tell them precisely what to ask and how to word it. What does the bad reference have to confirm you did well? It’s an uphill climb, but you can often overcome a bad reference you can’t avoid. You just have to prepare the ground in advance. Go back over that list of potential references. Expand it again. You will never be hurt by having too many good solid references to choose from. Next I’ll talk about the references that you don’t know are killing your job opportunities. This entry was posted in Accomplishments, References and tagged bad references, job references, reference check. Bookmark the permalink. Can you fit into the company culture?